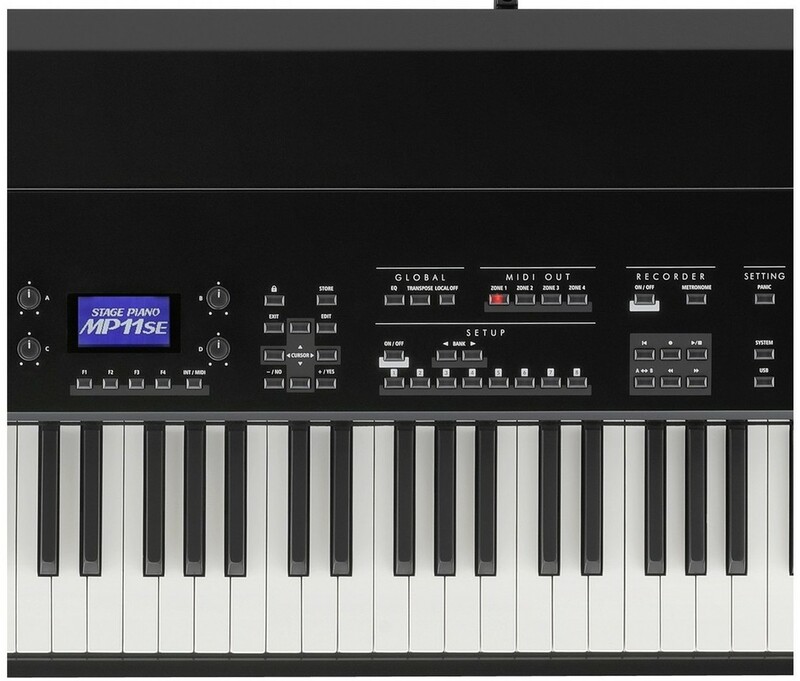 🎹 UPDATED COMPARISON REVIEW - March 10, 2019 - Kawai MP7SE and MP11SE - Recommended - Kawai piano company has recent replacement models for their previous MP7 & MP11 stage pianos which are now called MP7SE ($1799US internet discount price) and MP11SE ($2799US internet discount price). Both of these newer models have a few very important upgrades over the previous versions which I will explain below. If you want one of these new versions then I suggest you do not wait because Kawai keeps selling out of the both of these models since they were released and they will likely continue to do so because the demand for them continues to be greater than the supply worldwide. *If you decide you want either new model and contact me on or before March 30, 2019 I can help you buy it for a price far below any advertised sale price on the internet, Amazon, store price incl free shipping, no tax, brand new, with full factory warranty! Call me before you do anything with anyone. OK, so what is different in these new models as compared to the previous models? Well, as it turns out...not much in terms of quantity. However the things that ARE new are what I consider to be the most important features in a piano and that is a new key action in the MP7SE along with new piano chip sound realism, and the same new piano sound chip is in the MP11SE along with more responsive pedaling because of a proprietary new triple pedal system. I have played both of these models thoroughly and am impressed. 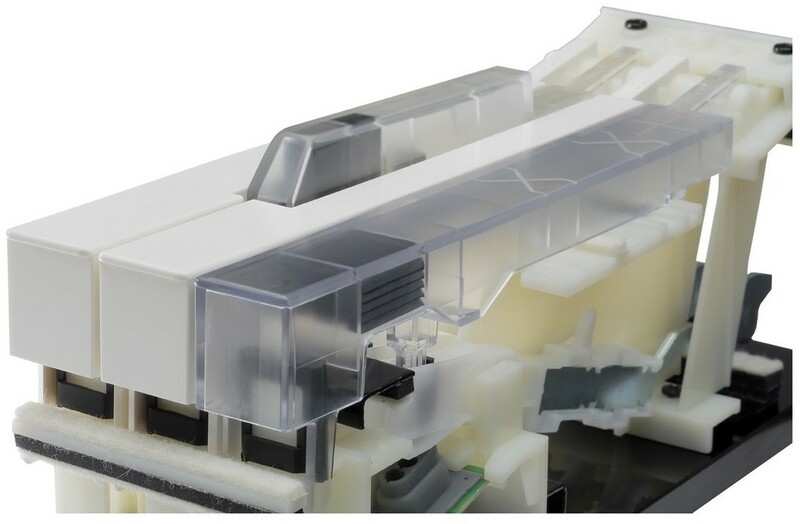 Kawai currently has a specific key action they use in their portable ES8 portable stage/home piano ($1999US internet price) called the RH3 (plastic key action) which now replaces the previous key action from the older MP7 which was called the RH2 (plastic key action). The difference between the two key actions is a couple of important things one of which is that there is more resistance and weight in the new RH3 key action so it more closely approximates what a real good acoustic piano feels like. The RH3 key action also has counter-weights built into each each (left pic) so that the key return response is more accurate and that the key returns faster after it is depressed. Keyboard counterweight technology is found in all acoustic pianos and a some digital pianos, but most digital pianos don't have it. So the new MP7SE key action now has counter-weight technology in the keys and also the keys have a better "piano-like" feel to them. The MP11SE key action has not changed at all from the previous model (which is a good thing) and it still has the very popular and well regarded Kawai "Grand-Feel" wood key action which has longer individually installed keys that offers a different and more precise fulcrum and pivot point than the MP7SE RH3 key action. The longer wooden key not only moves up & down much more like a real full size acoustic grand piano (it can be really difficult to tell the difference it's so good), but the transition in key weight and finger pressure needed to press the key down from one key to the next on the MP11SE is almost seamless. It feels pretty much the same whether pressing the white keys, black keys, playing towards the back of the keys or front of the keys, the transitions are really smooth and realistic. Even the black wooden keys have an organic wood feel on the sides of the keys just like a real grand. I know many people who own and play great acoustic grand pianos such as Steinway, Kawai, etc and they buy MP11's so they can practice with headphones so as to not disturb other people in the home, which they obviously cannot do on a real acoustic piano. The MP11SE key action is quiet and expressive and that's what advanced players require of a digital piano so they can practice in privacy and yet still enjoy their piano playing. So what else is different and improved on these 2 new models? Well, both of them have Kawai's top model piano sound chip with extended memory piano sampling. 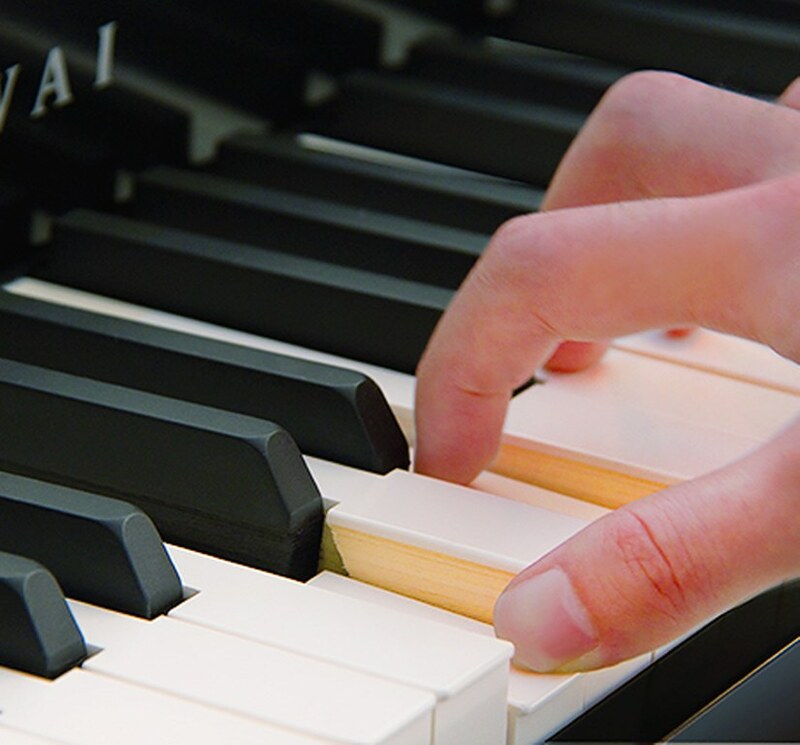 This piano sound chip offers a noticeably more natural and responsive piano tonal dynamic range and more organic elements of a real acoustic grand. There is a distinct difference in piano sound realism in these new models for the acoustic piano sounds as compared to the previous models. This change is on the MP7SE and MP11SE and the new piano sound chip comes from the top Kawai home digital piano model called the CS11 which sells for about $7000. Among other things this new piano sound chip offers 4 distinct individual sampled grand and upright piano sounds along with additional variations of those sounds so there is plenty of acoustic piano variety on the new models which is a welcome upgrade. It also offers precise piano editing control with the popular Kawai Virtual Technician feature that has many editing parameters to customize your piano sounds from within the piano. Kawai also has created a dedicated app for your tablet so you can more easily and intuitively make those custom Virtual Technician changes to your sounds and then save them. The other upgrades and changes on these newer models are that the MP7SE & MP11SE now both have redesigned side panels that are polished black wood rather than the more traditional dark mahogany wood tone side panels that were in the previous models. This is a more subjective change and I like both colors but the new black panel design which is also more flush with the keyboard itself along with the black color does make them look sleeker with a matching look to the rest of the piano. The new side panel redesign also added about 3 lbs more weight to the MP11SE. The other and last change to mention is that the new MP11SE has a redesigned proprietary and upgraded triple pedal unit called the GFP-3 as compared to the previous model pedal unit on the MP11. The triple pedal unit which comes standard with the MP11SE (optional for the MP7SE) now has advanced optical sensors built in instead of traditional sensors/contacts so that the pedal calibration and response is more precise and expressive. Some people will notice this change if they were to play both models (MP11 and MP11SE) both many people may not notice the difference. Nevertheless, the new triple pedal that comes with the MP11SE is more durable, more responsive, and adds another element of authenticity to your overall playing on this new model. The MP7SE comes with one sustain-damper pedal and that pedal is extremely durable and expressive so there was no change need for that one. Apart from the changes I just mentioned between the previous MP7 & MP11 models and these newer ones, everything else is identical in terms of function, features, digital controls, user interface...all of these things are the same and have not changed. Everyone that I know of (and there are many) who had purchased the previous MP7 and MP11 was very satisfied by their experience of those models and enjoy playing them. The main things that shoppers of digital pianos want to be sure of is that they will enjoy the "piano playing experience" of the model they have chosen and the MP7 & MP11 certainly rose to the occasion for most people. But with the new key action, piano sound chip, and pedaling (MP11SE) in the new models, these pianos are now more realistic than ever when it comes to replicating what a real quality acoustic piano does when you play it. Achieving a higher quality of piano authenticity is always a good thing and I believe that is what Kawai has done here. Tim, thanks for your up-to-date and knowledgeable review of the new SE models. Always appreciate your detailed information. You mentioned the new counterweights in the MP7SE; I guess the MP11 already had that feature? Hey Tim, how would rate the action of the MP7SE? Is the RH3 equivalent to say the Roland PHA-50 or Yamaha GH3X?